There’s recently been a lot of bad news about network congestion, etc. So I thought it was time to share some good news :-). Over the last couple of months, we have made a number of changes and improvements to the South African eduroam roaming service. Most significantly, last night we completed the replacement the two federation-level roaming (FLR) servers. More than simply an upgrade, this change represents a complete change in architecture, different hardware, and different physical locations. 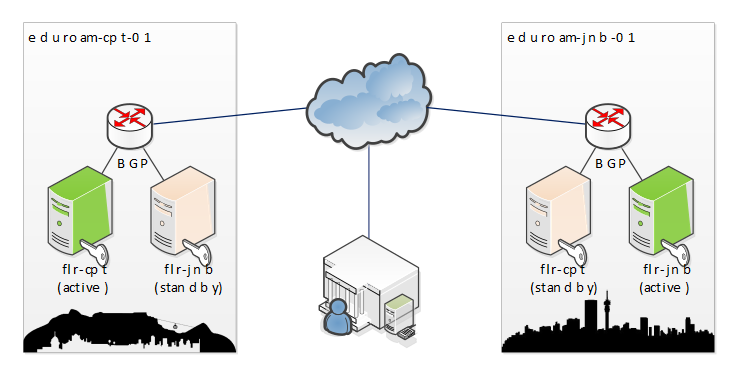 The new architecture has four instances (two active; two standby) of the FLR servers in two different cities (Cape Town & Jo’burg), providing both geographic redundancy and improved resiliency. Fail-over between the active and standby instances is handled by BGP route announcements, and should typically take no more than a few seconds. We’ve also introduced some courtesy monitoring as an experimental service. This has already helped three institutions detect problems that would have prevented their users from being able to roam successfully. In future, it will hopefully provide institutional help desks with better insight into what happens when their users are roaming on another campus and help them to be more proactive about problems with their service. You can find out about the monitoring system and the status of your realm at https://eduroam.ac.za/status/. The infrastructure changes should (hopefully) make the eduroam roaming service more reliable, which is important since South Africa now sees in excess of 165,000 inter-institutional authentications a day. I’m hoping to be able to make some stats available in due course. All of these changes were made as part of the service handover from the SANReN Competency Area to TENET, and represent a join effort by both teams and the culmination of many months of cooperation to ensure a seamless transition. I’d particularly like to thank Simeon Miteff and Johan Hugo for their significant contributions. Please note that TENET is now responsible for maintaining the infrastructure underlying the eduroam service. This means that going forward you should report service problems via the TENET SOC.